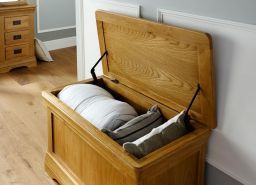 We are offering the lowest UK prices for these French Farmhouse Country Oak Blanket boxes. 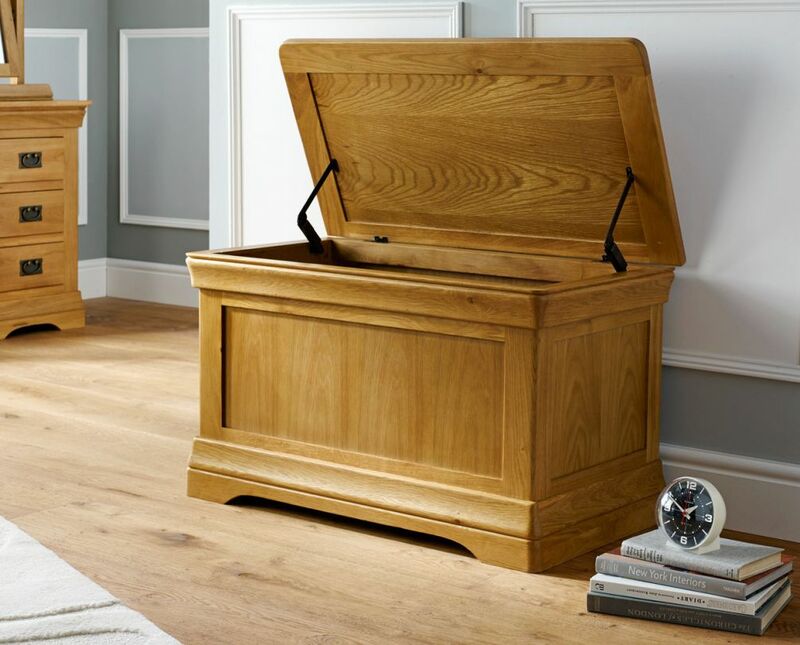 Hand made from sustainable American oak with a hard wearing oiled waxed finish these oak storages boxes are ideal for placing at the end of a matching oak bed. Great for storing clothing or kiddies toys! Dimensions: W 900 x D 465 x H 520 (mm) - Available to view in our Uttoxeter, Staffordshire and Dartford, Kent shops. Excellent service, lovely box, great delivery. Well made and fast delivery. Delivery team were also very good. Arrived earlier than anticipated when ordered over the Christmas break. Very happy with the service. Nice deep storage. Quality hinges that stay open when placing items into box with a soft close system. Bought 2 of these and I’m very pleased with the quality. Perfect piece of furniture at a really reasonable price. Beautifully crafted blanket box (we use as a toy box for our 6yr old) a great experience from ordering to delivery. Very pleased with the quality and style, just what we wanted. Would highly recommend this company. Beautiful quality blanket chest. Am delighted with the company service and quality of the chest. Delivery exactly on the time I was advised it would be. Excellent service from start to finish. We got a call saying our furniture could be delivered just 4 days after ordering. Then the night before delivery we had a text saying our furniture would be delivered between 6.30am/7am. 6.35am the furniture was delivered fully made up so no construction needed. Great for working people. Would throughly recommend this company so refreshing to receive top notch customer service who follow through on what they promise. Lovely piece of furniture, which has created a seat & provided storage in our entrance porch. Great service from everyone at Top Furniture, right down to delivery man, who delivered our furniture at the agreed time. My t.v. unit is really good, am very pleased with my purchase which I feel was good value for money. Very pleased with my chest. Well made and good value for money. I was delighted with the quality of this item, it was just as described and the service from the company was extremely efficient, advising me of a half hour slot delivery time. Would definitely buy from them again and recommend them to others. I bought 2 blanket boxes Which are of excellent quality, packaging and delivery were excellent and efficient. Thank you we are so far pleased with our 2 boxes which arrived today! Thank you. Not shopped with you before but certainly would again. The oak blanket box I bought is just perfect and at a fraction of the cost elsewhere. Delivery was free and very quick. All in all I can't fault the service and would highly recommend. Arrived today, looks stylish, and obviously great storage. Very please with the quality for the price paid. The blanket box complimented the existing bedroom furniture. We ordered cream and oak bedding box it didn't look right in our bedroom ,informed Top Furniture they were happy to help and change it for the full oak bedding box,delivered and picked up all with free delivery. Lovely quality at a brilliant price. Delivery very efficient, delivery staff extremely helpful and friendly. Will be recommending to family and friends. For the price I was expecting a bog standard piece of furniture - but had the pleasant surprise of becoming the owner of a substantial and very well made blanket box. How on earth can you supply quality of this kind at such a reasonable price ? I have purchased two and will be purchasing another two shortly. Keep this web site in 'your favourites' for future reference !!! A really well made attractive piece of furniture. The downside is the smell inside which I cannot get rid of. Bought this for my step dad and he absolutely loved it, he is picky when it comes to the quality of wood too :) thank you very much. Very good service. A very well-made , beautiful piece of furniture - solid and practical !! I am very pleased with my blanket box, really good quality. Delivery sooner than expected which was good. Stunning bit of furniture. Well made and has the added bonus of hinges that stop little trapped fingers. Thanks! Wow,wow,wow....what can I say. I am impressed with the finished work and it is very spacious. I can't wait to fill it up. 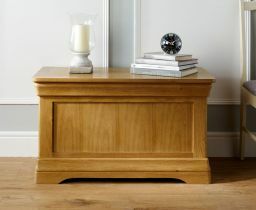 Wonderful quality excellent value-loved this blanket box very sturdy and it looks great what more could you want! 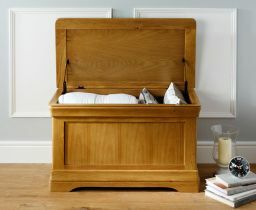 We are absolutely delighted with our oak blanket box-it is fantastic quality and we can't believe the value for money! Stunning piece of furniture that suits my (Victorian) flat beautifully. I bought it to house chopped wood for my log burner, and it has an added bonus of being a beautiful window seat. The box is smart looking and has really helped with extra storage. good looking box at a great price, however one down side is that it makes the blankets smell and its not all that pleasant a smell either. I have been looking for a blanket box for some time and came across your site by accident. I am so glad I did as I found exactly what I was looking for.I am absolutely delighted with my purchase.It is a first class piece of furniture,very well made and good looking.It was well packed and arrived on time. The delivery men were very helpful.I would recommend your site to anyone looking for excellent furniture at very good prices. Does exactly what it says on the tin. It appears to be good quality, at a good price. What more could one ask for? 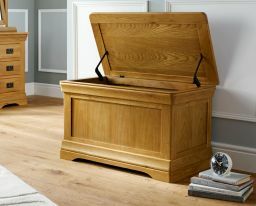 Good solid blanket box, made of quality oak Very good for the money!!! I am pleased with the quality and it seems to be supplied at a competitive price. Beautiful solid piece of furniture. Good value compared to others I have looked at. Soft close hinges so won't slam down on little fingers. Really pleased with it. Brilliant quality, great and quick delivery. I will be ordering other items soon. A lovely piece of furniture ....was bought as a toy box fo my granddaughters bedroom. It is very well made and was value for money. I looked on the internet for similar products but found none that compared favourably. Very pleased with our purchase. Prompt delivery and phone call with delivery time. Good build quality, sturdy, looks very good. Excellent value for money, only received farmhouse Country blanket box yesterday. So early days . This item of furniture (we bought two) does just what we wanted - safe, solid and attractive storage space for clothing, Good closing mechanism. We are very pleased with our purchase. Very well built,excellent safety for children not trapped on closure.delivered as dated. The blanket box looks very modern/stylish but is also very sturdy and excellent quality. The open/close mechanism is also brilliant as fingers don't get trapped. Would definitely recommend. Excellent quality piece of funiture. Lovely colour and perfect size. Could fit anywhere within a house and has many uses. Buying another one as the price is unbeatable as is the prompt and professional delivery. Excellent value for money. Very good quality and timely delivery. Best I could find on the Internet and really pleased with choice. We got this as a toy box for our son. It is exactly what we wanted - sturdy but a nice looking piece of furniture. The safety hinges make it ideal for children. Great value for money compared to similar products on the market. Excellent build quality and very sturdy. The soft closing hinge is superb as many other products do not offer this. Looks great and would recommend. All at a good price too. I was delighted with the box, which was exactly as I had hoped and is excellent quality and value for money. Especially pleasing is the smooth closing mechanism, which ensures the box doesn't slam shut. It is not always easy to choose items like this on line, which I had to do, and I trawled through many similar products. However, this one appeared solid and of beautiful oak, and I was not disappointed. Well made blanket box good value. Well made quality piece of furniture at great price. Would recommend. Very happy with the storage/toy box I ordered.